Yesterday marked the one-week anniversary of my arrival with my family to our new home in Georgia. We purchased a beautiful renovated house in Decatur, a near-eastern suburb of Atlanta. Hopefully, this will mark the opening of a longer chapter in my professional life, after sojourns in New York City and Lansing, Michigan. Five years ago, when we moved to Michigan, I knew that there was a built-in sunset to our stay. I had accompanied my husband who was enrolled in the accounting PhD program at Michigan State University. With the achievement of his doctorate, we felt the proverbial boot on our backsides. Time to move on. It turns out that five years is just about the perfect amount of time to feel like you've become a part of a community. We had our friends, our synagogue, our favorite restaurants and shopping routine. Now we are in unfamiliar territory. Every day is a new exploration of a place both very old and very new. Atlanta's trees tower over the streets, shading modest homes built when Jim Crow reigned supreme and Jews were viewed as foreigners. Those same trees hold in their arms ropes for children's swings; Indian-American children of CDC employees, African-American children of nurses and software designers, southern children of midwestern and northern expats, play together in the busy childcare facilities at the Greater Atlanta YMCA branches throughout town. There is a deep undercurrent of memory and a surface veneer of present-mindedness. Hipster thirty-somethings open artisan coffee shops where twenty-somethings jack into their favorite social networks. Here and not here. There is a sense of pageantry. B*ATL concluded just as we arrived in town. The organization sponsored a week of celebrations, readings, reenacting and other family-friendly activities to commemorate a devastating time of sectarian tensions in the nation's past. There is a feeling that amnesia lurks around every corner. If we can't make history fun, no one would want to learn about it. I don't know whether this is true. And I have much exploration ahead of me. I am looking forward to meeting colleagues in Georgia State's Heritage Preservation Program, to dipping my fingers and toes into the shadowed waters of the Atlanta-area history scene. I will report what I find along the way. In the meantime, I can reflect on a strange and wonderful journey southward. Watching my son enjoy french fries at the original Harland Sanders Museum and Cafe in Corbin, Kentucky, for example. 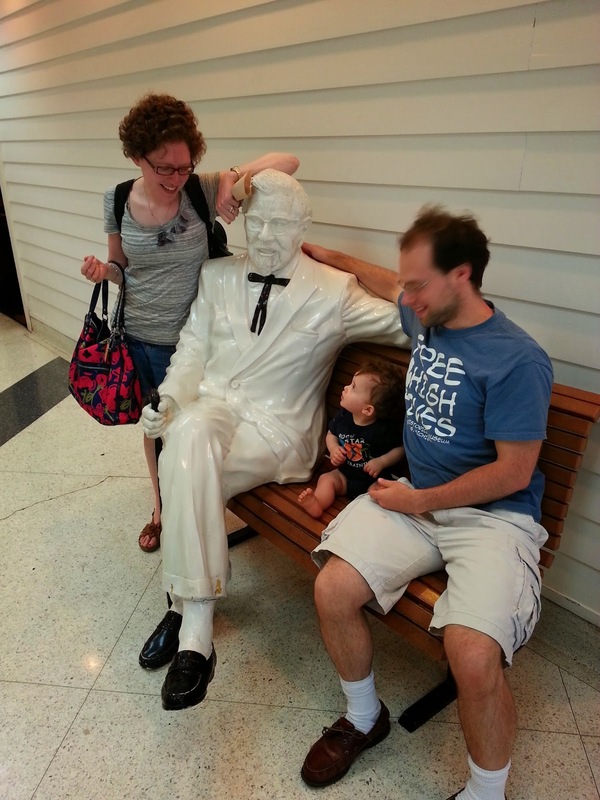 The Sanders Cafe is a museum and also a working, modern KFC restaurant. A most unusual combination. Of course, the museum's displays are hagiographical, but it does come across quite clearly that Sanders' primary innovation in the 1940s was that he could cook fried chicken fast. And what's more American than that?